Central Texas, especially that sweet spot halfway between Dallas and Austin where small swaths of the legendary old prairies remain, is an earthly paradise. Blowsy live oaks spread their heavy limbs beneath cloud-spattered skies, while creeks and rivers -- most prominently the meandering Brazos -- ripple alongside gently rolling pastures gilded with waving grasses. 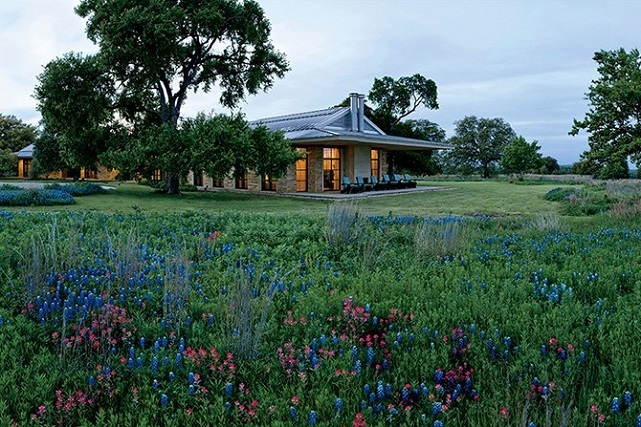 These natural glories are precisely what led Laura and George W. Bush to choose the area for their Prairie Chapel Ranch, the retreat they completed in 2001, just after he became the 43rd president of the United States. Occupying some 1,600 acres near the flyspeck town of Crawford, about 25 miles west of Waco, the property is anchored by a strong but relatively modest home that quietly honors its location. During the eight years Bush was in office, the ranch served as the Western White House and welcomed numerous heads of state -- from Russian president Vladimir Putin to Saudi king Abdullah bin Abdulaziz -- some of whom were coaxed to join the leader of the free world as he raced along the property's 40-mile network of bike trails. And, of course, there are the well-known stories of the president spending his vacations clearing brush, often in searing heat, sometimes encouraging aides to join him. These days the Bushes live in Dallas, also home to the George W. Bush Presidential Center, which opened last year on the campus of Southern Methodist University. But they regularly make the trip south to Crawford, where the former president is just as likely to be found handling a fishing rod or paintbrush as he is a chain saw. The ranch remains an essential getaway for the couple, a place to unwind and spend time with their daughters, Barbara Bush and Jenna Bush Hager, as well as Jenna's family, and to entertain close friends like Deedie and Rusty Rose, prominent cultural leaders in Dallas. The former first lady notes that when she was growing up in Midland, Texas, her father built spec houses -- "one story and low to the ground, a style you saw a lot in the '50s and '60s." She and her husband had a similar type of residence in mind for Crawford, mainly, she explains, "because we wanted the house to fit into the landscape." And she means fit literally. Heymann's design carefully nestled a single-level, three-bedroom limestone structure and an adjacent two-suite guesthouse into an almost imperceptible rise amid an existing grove of live oaks and cedar elms. Mr. Bush sometimes paints at an easel in the enclosed breezeway, where the windows are replaced with screens in warm weather; the ottoman and the cushions on the sea-grass chairs are covered in Sunbrella fabrics. In the study, pet portraits by Mr. Bush join a large work by John Clem Clarke; the Afghan carpet is by Arzu Studio Hope. Mounted on the living area’s limestone chimney breast is an Adrian Martinez painting, which over looks sofas clad in a Glant fabric, a club chair upholstered in a Groves Bros. print, and a cocktail table designed by Mrs. Bush; the windows are curtained in a Calvin Fabrics linen, and the ammonite fossils displayed atop the pedestal table were found on the property. Architect David Heymann conceived the house, Kenneth Blasingame Design oversaw the interiors, and the landscaping was done with Michael Williams. Wrapped by deep roof overhangs -- some up to 10 feet wide -- that serve to deflect the region's broiling sunlight and torrential downpours, the dwelling features tall windows that add a romantic transparency to its unpretentious countenance. "We wanted to see and enjoy the beauty as much as possible," says the former president. To answer the couple's desire for indoor-outdoor living, many of the windows are also doors that open to covered terraces and walks, buffalo-grass lawns, and the tree-shaded swimming pool. When the doors are flung wide, the home becomes a veritable pavilion, capturing passing breezes and filled with birdsong. The configuration also reduces the need for internal corridors -- often the Bushes navigate the place by strolling out one door and in through another. "It's slightly motel-ish, but we love that," Laura Bush says lightheartedly. The former first lady worked closely on the project with Heymann, who found her to be a highly perceptive accomplice. "She has a lot of experience from seeing the carefully organized houses that her dad built, and she has a very, very good eye," he says. 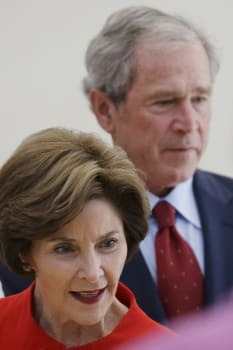 Early in the construction process Laura Bush pointed out that the masons' work on the Texas Lueders limestone that clads the exterior (and some interior) walls of the residence was absolutely perfect -- and thoroughly wrong. The Bushes wanted to have a subtly rustic, handcrafted look, and Heymann had deliberately chosen to use the so-called rough-back pieces that were traditionally thrown away in the trimming process rather than smoothly finished blocks. "We had to take away their levels," the architect recalls, adding that the stone was relaid the old-fashioned, slightly irregular way, with taut string and appraising eyes. An advocate of sustainable design, Heymann incorporated into the compound a number of green features, including a geothermal energy system for heating and cooling. Rainwater runs off the house's standing-seam metal roof and into a gravel-filled moat, where it filters into a 42,000-gallon cistern concealed beneath the rear terrace and is recycled to irrigate the lawns. For the full story and more photos, subscribe now and get the digital edition immediately. Tour Laura and George W. Bush's magnificent Texas ranch. Also see: Tom Brady and Gisele Bündchen's Custom Chateau.